Sophia Loren is known to have said, "Everything you see I owe to spaghetti." Well I can say the same, but, there is no way that I have what Sophia Loren has. Perhaps I do, it's just super-sized. This is why once the warm weather arrives you will find the occasional sweet treat here on these pages, but, are more likely to find a plethora of salads, barbecued fruits and vegetables, and all manner of lighter entrees at More Than Burnt Toast. Spring has arrived!! This coming long weekend we are anticipating visits to local wineries that are just opening for the season, a maple syrup festival in the downtown core, and long bike rides to kick that "winter flab" to the curb. Our minds may have one foot heavily into Spring, but, our farmers markets are empty of local produce. To revitalize our tastebuds the arrival of lemons could not be more timely. Lemons are grown year-round with a peak harvest in the winter months. They are available all year but their sunny cheerful colour seems to have me doing a Spring happy dance more than ever. These vibrant, yellow citrus fruits bring a tangy flavour and tart fragrance to daily dishes, where its' cheery, refreshing presence dresses leafy salads and serves as a light marinade to my Spring and Summer pasta dishes. From cakes and biscotti to sautéed meats and vegetables, a little lemon goes a long way. Quite possibly as popular and widely used as simple spices like salt and pepper in my kitchen, lemon juice and zest have found their place in Mediterranean cuisine and my kitchen. This salad is not your everyday mayonnaise based salad, but, instead has layered flavours of olive oil, grainy mustard and peppery arugula. A perfect picnic dish for the first weeks of Spring!! No es necesario ser Sofía Loren para hacer de una ensalada todo un éxito, esta tuya por la foto se ve buena,pero no puede acceder al contenido de la receta! Supongo que son cosas de blogger! No need to be Sophia Loren to make a salad a success, this photo of yours looks good, but can not access the contents of the recipe! I guess things are blogger! I have copied the recipe Elena and sent it to you my e-mail. A wonderful combination and tasty salad! I love your blog's new look. I just bought everything for mine..and no arugula..next yr..or this summer..
Love anything with potatoes and I am sure this would be a winner in the house. Happy Easter! If spaghetti made ME look like Sophia Loren...I would be eating way more of it! Alas, I'm stuck with salads. But with salads this tasty that's not a bad thing! Great salad! Sounds like lots of things to do. We are still under 2 ft of snow! 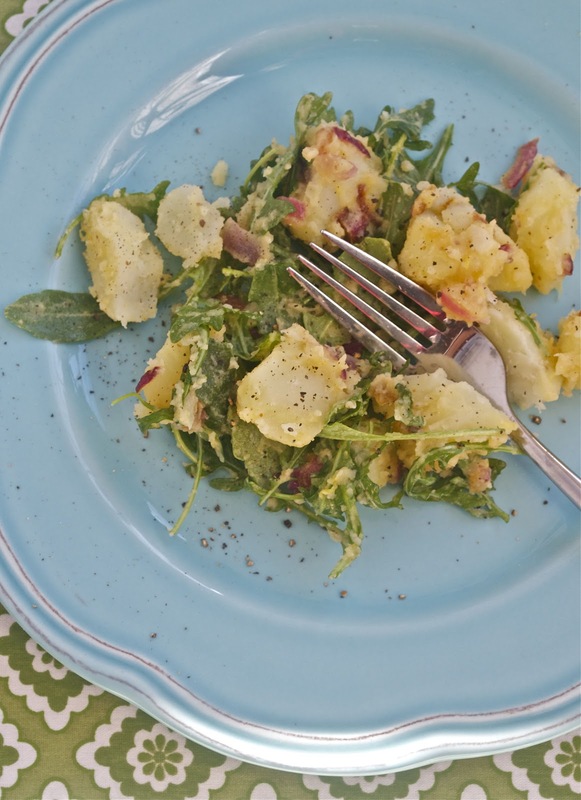 I enjoy potato salad made without mayo for a summer picnic...yours sounds perfect. Hmmm - maybe I need more spaghetti in my life. I'm nowhere near Sophia Loren. My favourite things in the entire world involve potatoes Marta!!! Love the idea of adding a little green to that salad - yum! 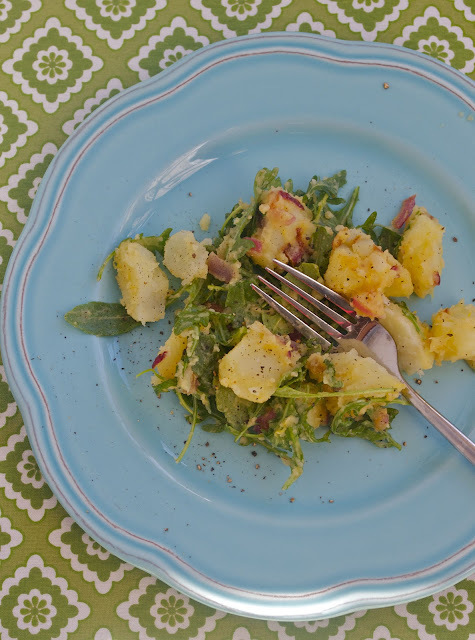 Hi Val - I like the arugula in your potato salad. Adore Sophia too. I love arugula and am so happy it's more readily available in the produce section these days! I will most certainly be trying this. I think I know why Elena couldn't access the recipe because at first I wondered where the 'Read More' link was to see the rest of the post. I found that when I clicked on the title of the post I was finally able to find the rest of the post. Yes thank you. nRelate is working on a fix for me to have the "read more" above their window links, which seems to be taking a very looooong time. I had contacted Linked Within and never received any response at all. Ahora si, he podido verla bien, gracias Bellini! i'm pretty excited about any potato salad that eschews mayo--that stuff's gross. this sounds zippy and delicious! I'm not fond of mayo anyway. I'd take this one in a heartbeat.